I was very impressed by this pattern from the first time I saw it...but felt it was much too complicated for me to attempt. If anyone else has been put off, then I encourage them to give it a try. I did not try to do two colours or add beads down the back, and I still managed to have the eye beads on the wrong shuttle but despite that I think he looks cute. The thread is an vintage reel, probably about a 60, as my little fellow measures 4 inches long. The beads were a couple of those little seed ones from my daughter's beading box. The pattern is from Jane's site, (not the naughty one!) and is called Pamela's gecko. On Pamela's page you can see her collection of geckos, which are truly brilliant, but if like me you were afraid to try then don't be. You do have to follow the pattern step by step, at no point can you just "wing it", or you'll find yourself unpicking, but otherwise it's quite easy. Hi Snowy! Your are so funny, mentioning Jane's "other" site, LOL! Isn't that funny? I did a post about that, too, I thought it was so hilarious...plus the timing of it with other things that happened too, prompted a post about it...anyway...enough about me...LOL! Your gecko is very nicely done. Thanks for sharing it and Pamela sure has done a popular pattern with that one! Your gecko is adorable! I think I might have to give this one a try. Thank you Tatting Chic and Diane. Diane, I would love to see your gecko, so do have a go...but, warning, this is not a "relax in front of the TV" tat, you have to count the stitches on every row! 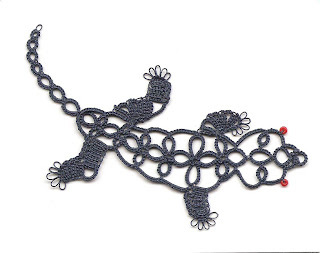 Great job on the gecko & I just saw your bobbinlace too! Glad to know I'm not the only one who loses it when the pins come out! Yes he DOES look cute! You did an awesome job. Lovely gecko. Well done. SO pleased you could follow the pattern too. If you ever get the beads on the wrong thread like that again (I do, regularly) try a SLT!! I know how to cheat too!!! As for my 'other' site - perhaps I should consider it as a career move. Hmm, not at the age of 65, I guess!!!! Gina, I just went and looked at your bobbin lace, wow! I haven't tried sewing in, just the finishing of a round. Thanks Sherry, it's an awesome pattern! Jane, I am so dumb I thought I was right for the beads until after I had done the first one...well it looks better if they are both wrong, I wouldn't want him squinting! I will try this again, though, thanks for the hint. You did a wonderful job with the gecko. His eyes look fine whichever way you do them. Will you make more now you are bitten by the bug. You really can tat it watching TV once you get the hang of the pattern. I have to get the leaf tail published soon. The gecko looks great! Most of us would never have known you had a problem with the eyes until you told us, he looks good that way.